Generic Fluoxetine is an antidepressant, one of the most widely prescribed drugs of that kind in the world. It is prescribed for treatment of major depression, obsessive-compulsive disorder, bulimia nervosa, panic disorder and premenstrual dysphoric disorder. It is also used in treatment of post-traumatic stress disorder, body dysmorphic disorder, trichotillomania, alcoholism, cataplexy, obesity and binge eating disorder. The active ingredient of this drug is fluoxetine hydrochloride, an antidepressant that belongs to the class of selective serotonin reuptake inhibitors (SSRI). Like other SSRIs, it affects neurotransmitters, more precisely serotonin, which either attaches itself to the receptors on the surrounding nerves or goes back to the nerve that produced it, where it is taken back up and re-released (this is called re-uptake). Most experts agree that the imbalance of these neurotransmitters is the main culprit for depression. 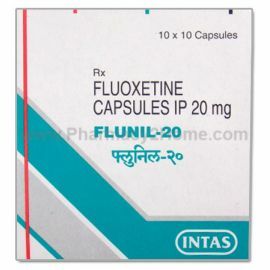 Fluoxetine reduces the uptake and increases the stimulation of nerve cells by the free serotonin. Generic Fluoxetine must be kept away from sources of direct heat, sunlight and moisture and stored at room temperature, away from the reach of children. 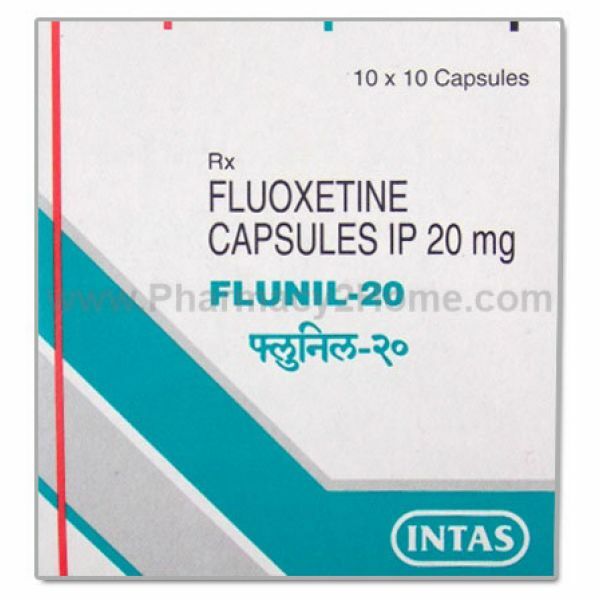 Generic Fluoxetine 20 mg is an oral drug, taken by mouth, with some water, usually once per day. If it causes stomach problems, it can be taken with meals. The exact dosage depends on the issue for which the drug is prescribed. For example, the usual dosage for treating depression is 20 to 80 mg per day. Bulimia is usually treated with 60 mg per day, OCD with 20-80 mg per day and premenstrual dysphoric disorder with 20 mg per day. Overdose with Generic Fluoxetine can be very dangerous. If you suspect you have taken more than the allowed amount of this drug, please seek immediate medical assistance. Symptoms of an overdose may include severe dizziness, persistent vomiting, fainting and seizure. If you happen to miss a dose, take one as soon as you remember, however not if the time for the next scheduled dose is near. Doubling the dose to catch up can be dangerous. Inform your doctor if your symptoms worsen despite the treatment or if you start experiencing new symptoms, such as suicidal thoughts, panic attack, severe anxiety, hostility, irritability, impulsive actions, insomnia and similar. Do not combine this drug with alcohol. Generic Fluoxetine can make you dizzy so it is recommended to avoid driving or operating heavy machinery while using it. Inform your doctor if you suffer or have suffered from kidney and liver disorders, diabetes, low sodium levels, dehydration, seizures, stomach ulcers or glaucoma. Caution is necessary when using this drug during pregnancy. Some of the common side effects of Generic Floxetine may include nausea, headache, fatigue, drowsiness, dizziness, sleepiness, insomnia, anxiety, sweating and yawning. More serious side effects include unusual bleeding and bruising, mental changes, muscle weakness, decreased libido, sudden weight loss and dilated pupils. This drug is a generic form of some of the most widely used antidepressant brands in the world, such as Prozac. It is highly effective against a number of psychological disorders, most notably depression. It can be prescribed for different degrees of depression and it is also widely used as complimentary therapy in other mental disorders. Generic Floxetine should not be used during pregnancy. If it is absolutely needed, make sure to inform your doctor and your Ob/Gyn. Do not use this drug if you have had an allergic reaction to fluoxetine hydrochloride or any of the drug’s inactive ingredients. Do not stop taking this medication before the doctor tells you so, even if you start feeling better. Inform your doctor if you wish to stop taking it, since some conditions may worsen if the drug is abruptly stopped.